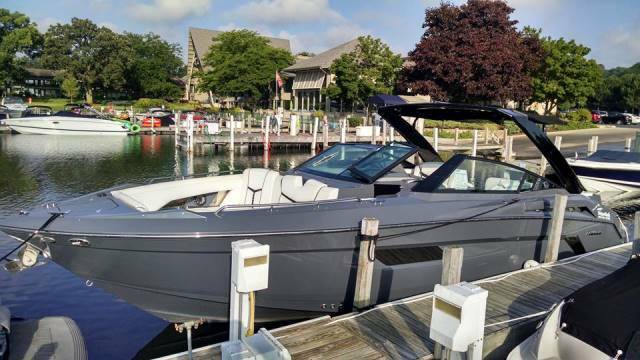 2017 Cruisers Yachts 338 South Beach Edition - Bow Rider, Sporty performance meets refined styling aboard the Cruisers 338 South Beach Edition - Bow Rider. The design includes a commanding gray hull with your choice of sand dollar or vibrant ochre upholstery, which stretches from bow to stern for extensive seating options. What's more, its custom-built aluminum tower screams speed. You'll find even more space to reconnect inside the cabin salon, allowing you and your guests to relax in shade and comfort. 2017 Cruisers Yachts 54 Cantius Imagine setting forth on a yacht that announces to the world that a renaissance of style and innovation is upon us. Awe-inspiring and free-spirited, the 54 Cantius was envisioned for those who live joyously spontaneous lives on and off the water. Three luxurious staterooms, refined appointments and ingenious features all exemplify perfection. But it is the manner in which the 54 Cantius seamlessly integrates living spaces with gentle breezes and starlit nights that truly evokes passion. 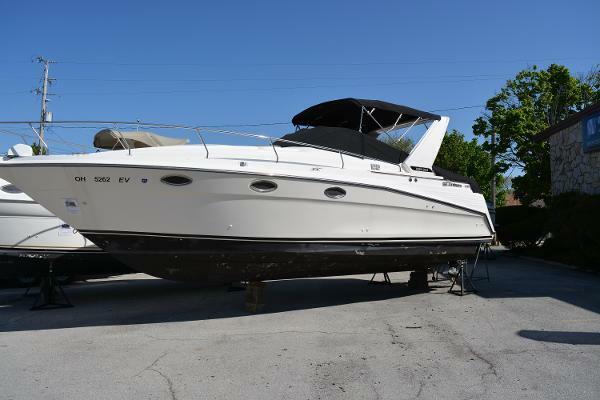 2006 Cruisers Yachts 420 Express Factory Hardtop - Bow Thruster - Cherry Wood Interior This boat is off site, please call to set showing appointment.Sales office is closed on Sundays. 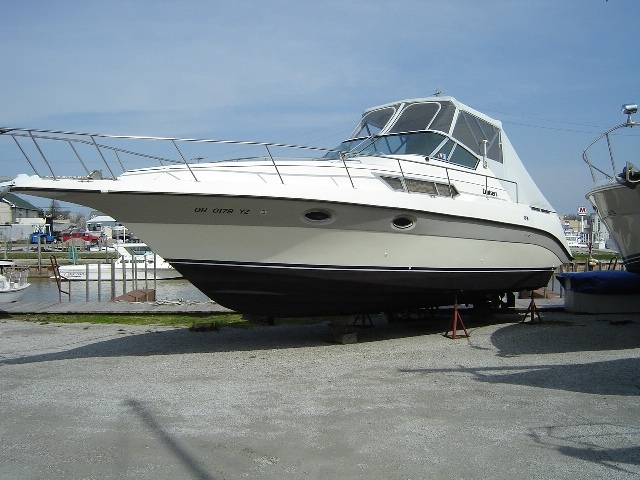 2005 Cruisers Yachts 405 Express Motoryacht Absolutely gorgeous example of this Cruisers 405/415 Express Motor Yacht that has lived its entire life under a covered slip right here on the fresh water Ohio River! No excuses needed here - this one is as clean as they come. Powered by a pair of Merc 8.1L HO 420 HP inboards with 535 hours of total time. 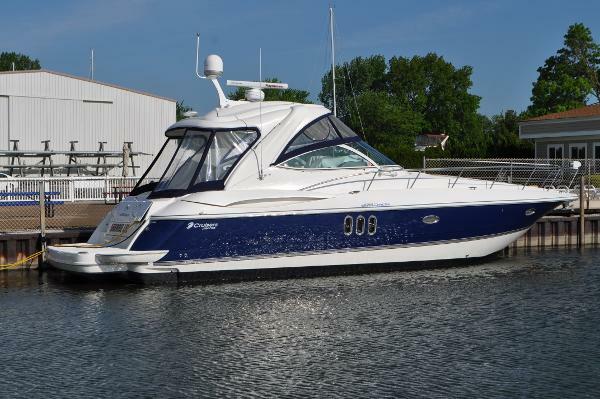 Partial equipment listing includes:T/S 8.1L HO Mercs - 420 HP and Closed Cooling (535 hrs)10 KW Kohler Low CO GenSet (984 hrs)Ray Marine E120 Radar/Chart w/Open Array and Transom CameraRay Marine 215 VHFMerc Smartcraft Instrumention with System ViewBow ThrusterAnchor Windlass with Helm RemoteRemote SpotlightRudder Angle IndicatorFull Cockpit Hardtop w/EnclosureClarion AM/FM CD/CD Changer with Amps/Sub/Helm RemoteCockpit Air/HeatCockpit Wet Bar with Combo Icemaker/RefrigeratorCockpit CarpetForedeck Sunpads w/CoverGlendenning CablemasterTransom Storage BoxHot and Cold Transom ShowerScreen Door for SalonReal Cherry Wood InteriorCherry Entry Treads on Salon StepsUltra-Leather Salon Sofa with InclinersInterior Carpet RunnersSalon Entertainment Center with Flat Panel TV/DVDMaster Stateroom Flat Panel TV/DVDGuest Stateroom Flat Panel TV/DVD110/12V Full Upright Refrigerator/Freezer2 Burner Ceran Top StoveMicrowaveCoffee MakerVacu-Flush HeadsMacerator Pump Out for Holding Tank This is a very innovative design by Cruisers Yachts. This design gives you an exterior cockpit like an express cruiser with a full aft cabin motor yacht interior. Excellent cruising vessel with it's 2 private staterooms and heads and lots of storage and hanging space. The full hardtop eliminates a huge amount of exterior canvas and still allows for plenty of fresh air or climate control if desired. 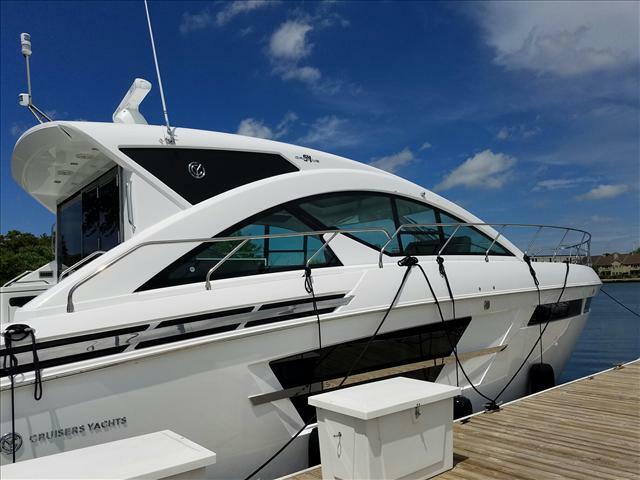 If you are looking for an exceptionally clean used motor yacht this is a must see! 1988 Cruisers Yachts 3110 SEA DEVIL, The 3110 Sea Devil is the sport fisherman?s model of the popular 3160/3260 and boasts a similar open interior layout with a dinette aft and to starboard. ?Fits the Bill? shows very well with several recent upgrades including an installation of cabin air conditioning and canvas. 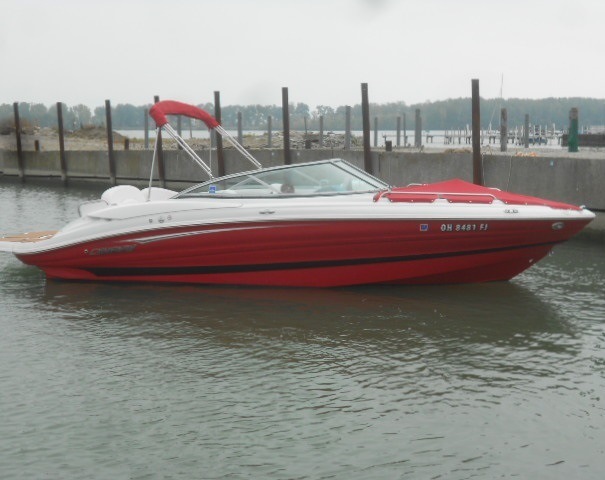 Built on a modified-V hull with integrated swim platforms and solid fiberglass construction. Below decks, the Sea Devil model sleeps up to four in a very roomy interior layout with good headroom and ventilation. The cockpit area is designed with sport fisherman utility, with ample rod holders, in deck storage well areas and twin swivel helm seats. Soon to be ready to go for a season of weekending or fishing. Trades considered. 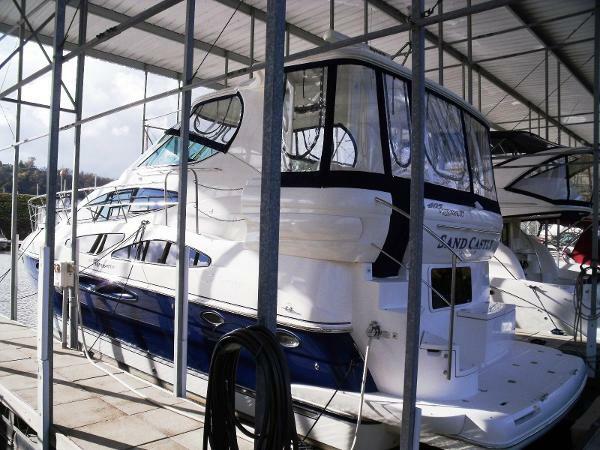 2003 Cruisers Yachts 3470 Express Give us a call about this Great Cruiser Yacht! 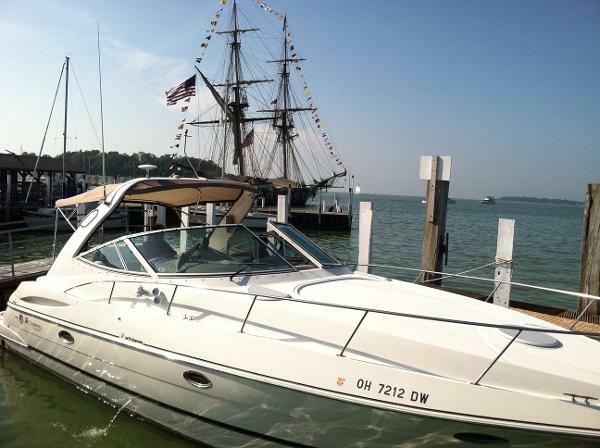 She haves everything you need to enjoy a weekend on the water. The boat had a new canvas made back in 2013 so its in very good shape. She is equipped with a Garmin 492 GPS, a Vizio flat screen TV in the aft cabin, air conditioning, vacuum head and many more. Call now for more details!